Transgender Americans Race To Finish Paperwork Before Trump Administration Transgender people are concerned how rights may change under the new president. Many are hurrying to complete the process of changing genders on government documents before Donald Trump is sworn in. Dylan and Hayden (front, left to right) are adopted 10-year-old twins. Born a boy, Dylan has identified as a girl since age 4. 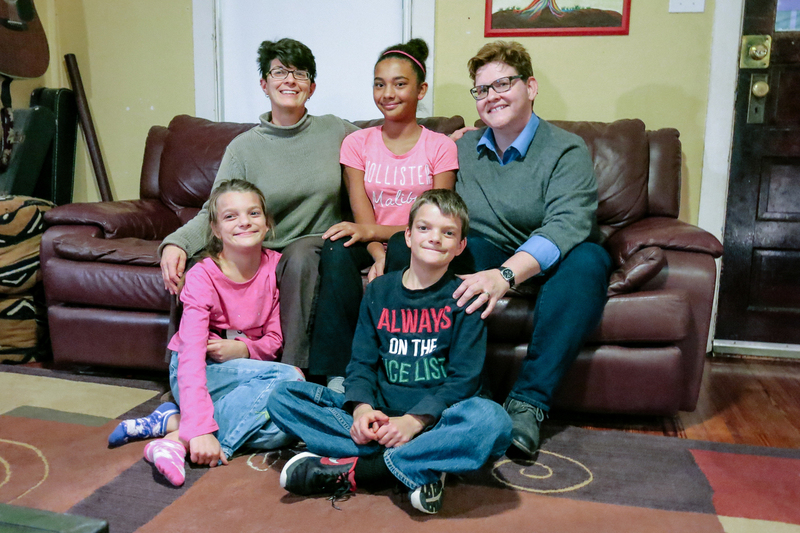 Her mothers Jennifer and Marla (top, left to right, with daughter Michaela in the middle) had planned to change the gender listed on Dylan's official documents when she got a driver's license. They sped up that process after Donald Trump's election. "Virtually every — if not every — appointment he has announced so far has been an extremely anti-LGBT person," says Keisling. She says trans advocacy groups around the country have been fielding calls from concerned people ever since the election. And they are not alone. "The calls to our office have increased a lot," says Benjamin Jerner, managing partner of the Philadelphia law firm Jerner & Palmer, which specializes in lesbian, gay, bisexual and transgender legal issues. States control many government documents, such as birth certificates and driver's licenses, Jerner reassures his clients. A new president won't affect those. Of more concern, he says, are gender designations on federal documents such as passports, immigration papers and Social Security accounts. Jerner says passports are the biggest concern because State Department rules could be changed relatively easily under a new administration. 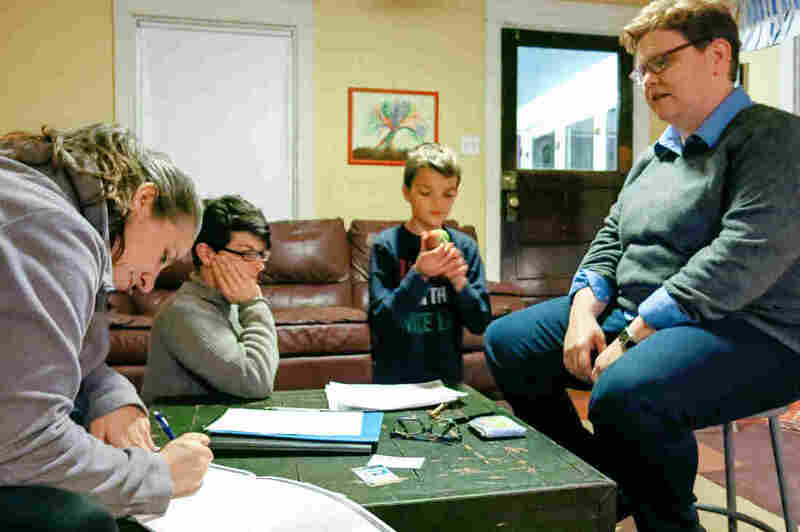 Deciding whether to change gender designations on documents can be an especially tricky question for parents of transgender children. Jerner recently held a legal clinic for such parents in Philadelphia and says 18 families showed up. "I think that just tells you the level of fear and anxiety that's out there," he says. Among those attending were the parents of 10-year-old Dylan, who was born a boy but — with her parents' encouragement — has long hair, wears pink and lives as a girl. That fits with guidelines from the American Academy of Pediatrics, the leading U.S. group of doctors serving children. The general idea is that parents should support their child and not make any big decisions that could limit the child's options in the future. That's because some children who appear to be transgender early on are not when they grow up. NPR agreed to use only first names for Dylan and her family. Some groups consider it a form of abuse to allow a child to transition to the opposite gender — even though it's in line with the AAP. Dylan's parents — Marla and Jennifer — say other families have had child abuse reports filed against them after they were identified in news stories. Marla says Dylan has identified herself as a girl for as long as she could talk. "It took us about three years to really sort out with Dylan what that meant," Marla says. "We kept telling her, 'Oh, there's lots of ways to be a boy — you can be a fancy boy, you can be a sparkly boy.' " But Marla says Dylan steadfastly insisted she's a girl. Marla says they plan to administer puberty blockers when Dylan reaches that stage. That will make it easier for Dylan to physically transition to female later if she chooses. Dr. David Levine, a professor of pediatrics at Morehouse School of Medicine in Atlanta, says this is a good approach. "I predict this 10-year-old is going to do great, because the parents are so on board and so supportive of their child," he says. Levine says he's not too worried that a Trump administration will make big changes that will affect transgender people. But he also is not opposed to parents who want to change their child's gender designations now because, technically, that's something that could be reversed in the future if it became necessary. Dylan's parents had planned to change her gender on government documents when she got a driver's license. Because of their concerns over the political climate, they are doing that now instead. So, on a recent evening — just as Dylan and her siblings were finishing up homework — a notary came to their home to witness Marla and Jennifer signing a short stack of papers. Once filed, they will change the gender listed on Dylan's birth certificate, Social Security account and passport — when she gets one — to female. A previous Web version of this story labeled the American College of Pediatricians an "anti-LGBT group." That is not an accurate description because the group holds opinions on a wide variety of issues.